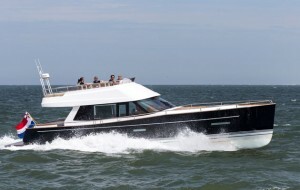 It’s not often that we go back for a second bite at a boat that’s already been given the full MBY sea trial experience. However, the addition of a flybridge to the already competent Contest 52 promised much, so Jack Haines was duly despatched for Round Two. On this extensive two-day sea trial, Jack finds that the Contest 52MC Flybridge can tackle both choppy seas and inland waterways with equal grace and poise. The flybridge design is a first for Contest Yachts, but you wouldn’t know that to look at the comfortable, sociable seating layout. One small complaint concerns the steep angle of the flybridge steps, although spiral stairs are much preferable to a ladder. We also take a look at the upper helm position, which is ideal for rubber necking as we progress through the Dutch inland waterways. Out on the open water the smaller 550hp Cummins QSB 6.7-litre diesel engine comes into its own, delivering a top speed of 27 knots. To watch Jack’s video report on the Contest 52MC Flybridge, click on the video above, and for the full review, pick up the April edition of Motor Boat & Yachting, which is out today (5 March).